I live in Luxembourg, one of the smallest countries of the world, lost between its big neighbours, France, Belgium and Germany. In our corner of Europe it is easy to be overlooked and even people driving through might miss the fact that they have been here. It is, however, a beautiful country rich in history that has seen many different rules over the centuries and has still managed to remain what it is. "We want to remain what we are" is the country's motto. As far as I remember, I have always enjoyed drawing. I did not have the confidence to pursue art as a career, but the idea of drawing has always stayed with me. 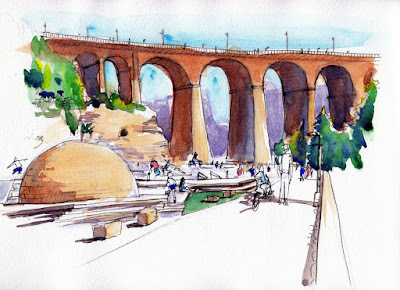 A few years ago, I stumbled upon the Urban Sketchers blog and discovered this international community of sketchers that motivated me to pick up sketching as a regular habit. After I participated in the symposium in Barcelona, I was completely sold. At first, I was a bit intimidated about sharing my sketches. There are so many amazing artists! However, I quickly realized that everyone is incredibly supportive of each other and I started to see sketching as a way to experiment, learn and simply to have fun. Sketching is for me a way to relax and to let the playful part of me express itself. It also allows me to do another one of my favourite things: meet new people from all around the world. The Urban Sketchers community has become like a big family spread out all around the globe. A couple of years ago I joined a small local group in Luxembourg who met once a month for a sketchcrawl. I have since then become one of its administrators and last year we were officially recognized as the Urban Sketchers Luxembourg chapter. Our group is slowly growing and maybe one day - who knows? - we will bring the symposium here. In the meantime, I am very happy to contribute to this blog and show you the occasional glimpse of Luxembourg. Béliza serves on the Urban Sketchers Editorial Board and is a founder of Urban Sketchers Luxembourg. She is fluent in English, French, Portuguese, German, Spanish and Luxembourgish. See more of her sketches on her blog, on Flickr and on Instagram.